I’m working at the very lovely delicious. magazine this week, which is always fun – great magazine, nice people, an almost endless supply of tea (which, to a freelancer, is like a miracle) and more often than not, suitably delicious food to test – but today the shock of eight hours of solid work finally hit me, and I had to cancel the evening’s beer-tasting plans (I know, I know) and scurry straight home. Well, I say straight, although it was the first time I’ve ever been on a bus which attempted a u-turn at a major junction, which gave me ample opportunity to contemplate my dinner. When a cold lurks, I always reach for intense flavours – chilli oil, fermented black beans, coriander – but after mandolining half my thumb off last week in pursuit of a stir fry, I was prepared to go for something a bit less labour intensive – kale with chilli and garlic perhaps. But kale not being a Turkish favourite, that meant a trip to Whole Foods which, praise be, brought me into contact with the winter’s first purple sprouting broccoli, all the way from Devon. I love PSB. And I didn’t make the most of it last spring, because I was deprived of anchovies thanks to a muddle-headed decision to go vegetarian for Lent, so I lost no time in making up for it. Nothing complex – some Sharpham Park spelt that I’ve been meaning to try out for a while, tossed with a pungent mixture of sautéed garlic, anchovies and chilli, and of course, lots of broccoli. Followed by too much butterscotch Angel Delight won in the Coach and Horses quiz and saved for just such a miserably eventuality. 1. While the spelt’s cooking, heat the oil in a frying pan over a medium-low heat and soften the garlic and anchovies together until the fish dissolve into the oil (I often add some of the oil from the jar or tin to the pan too). 2. Turn the heat up and add the broccoli. 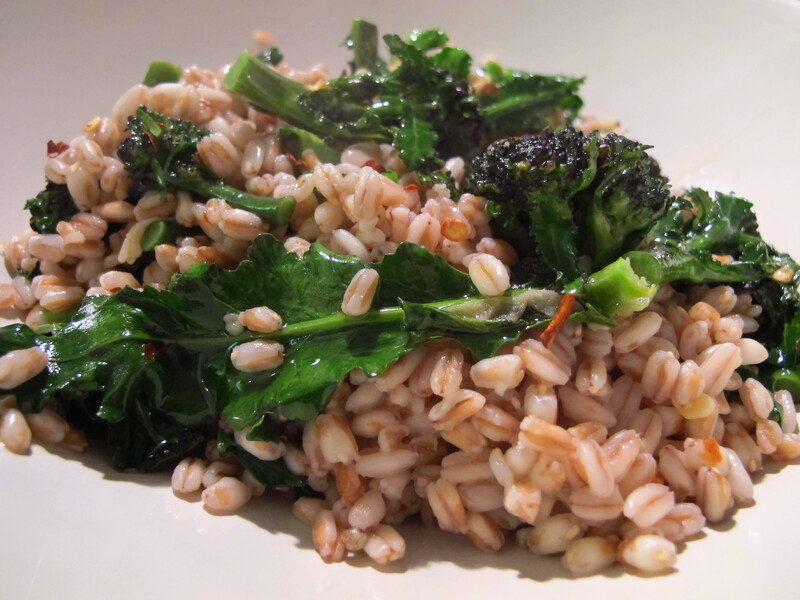 Saute until al dente (or to your particular taste) – I often stick in some of the spelt cooking water once I’ve drained it to help things along – then tip in the spelt and a sprinkle of chilli flakes and stir to mix everything together well. Season (the anchovies are quite salty, but you never know) and scoff in a big bowl in front of Masterchef while feeling a bit sorry for yourself. Spelt is a a type of wheat as you know – Here in Switzerland we use barley to make a a Gersten Soup, what you have in your photo looks so dry! Why not add some more water and a pork bone – then it becomes something a little more appetizing. Nice isn’t it – so wholesome you feel like you could add a vat of oil and still come out of it smug? You could use brown rice or bulgur wheat as well I s’pose. Fergus – um… I do happen to disagree that it looks dry (I can confirm it had a goodly amount of oil on it) but I do like prefer things like that to chunky soups to be honest: I always end up spooning up all the broth first so I can get to the solid stuff. But, although you may well be right, I’m not sure what you mean about not being able to take criticism here?! Sorry Felicity, I take my 2nd comment back – my mistake I did not see that you had “Authorized” my 1st comment – I only saw Karvey’s comment. Please accept my sincere apologies for jumping the gun.